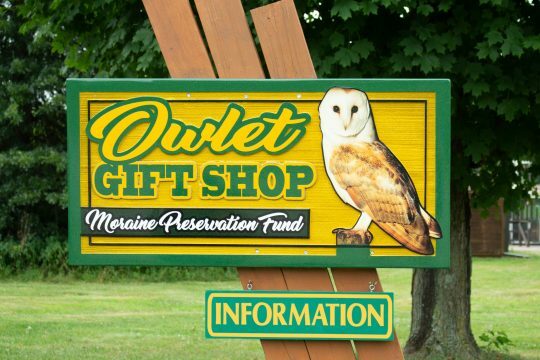 The Owlet Gift Shop & Nature Center has a unique collection of nature guides, gifts and souvenirs. Feature items include original photographs by Jacob Dingel, Wildlife art bookmarks by Carl Freeman, hand thrown pottery by Clean Creek Products and Zotter Pottery, maple syrup from Old State Farms, Moraine honey, hand made bird houses, plus a vast assortment of t-shirts, hats and sweatshirts. Marburgers Dairy drinks and ice cream are also available. Many items are from Pennsylvania and promote Butler County products. Tickets for Nautical Nature cruises are sold at The Owlet Gift Shop. You may also order Memorial Pavers, make a donation to MPF or sign up as a volunteer here too! The gift shop features a North Country Trail (NCT) section with NCT logo merchandise. Maps of the trail, hats, and t-shirts are now available.